which stitches are increased to shape the heel cup. This type of sock features a wedge toe and round heel, which are typical of socks knitted from the top down. But, unlike those worked from the top down, there are no gusset stitches to pick up or Kitchener stitch to work at the tip of the toe! The upper leg is worked using a one-size larger needle which increases the circumference slightly to accommodate the calf muscle. The instructions for all sizes and gauges use a multiple of 4 stitches, making it easy to substitute any 4-stitch pattern of your choice. Depending on the number of stitches for a particular size and gauge, many other stitch multiples are also possible. The instructions here range from a child’s medium to an adult large in gauges from 4.5 stitches/inch to 10 stitches/inch. 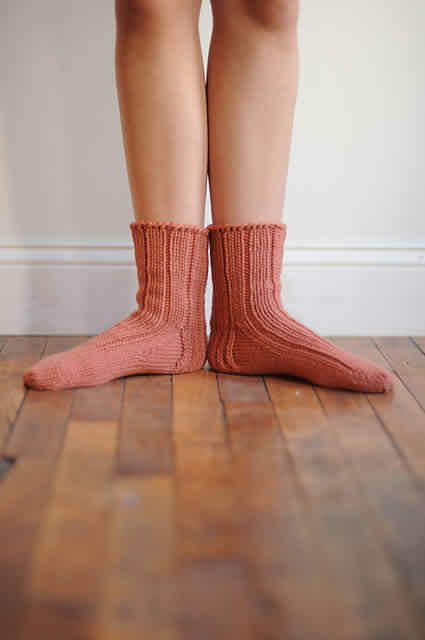 Knit a swatch to determine your gauge, find your gauge (in stitches/inch) along the lefthand column, and follow that row across to the column that matches your foot circumference. All the sample socks shown have an 8″ foot circumference. Instructions are for six sizes (child through men’s sizes) in 11 gauges (4.5, 5, 5.5, 6, 6.5, 7, 7.5, 8, 8.5, 9, and 9.5 stitches/inch).